For other uses, see Stand Back (disambiguation). "Stand Back" is a song by American singer-songwriter Stevie Nicks from her second solo studio album The Wild Heart (1983). It was released as the lead single from the album in May 1983 and went to number five on the Billboard Hot 100 and number two on the Top Mainstream Rock Tracks chart in August of that year. The song has been a staple in Nicks' live shows since its pre-album debut at the 1983 US Festival, and it has also been included in Fleetwood Mac tour set lists since 1987. In the United Kingdom, the single was given Nicks' first 12" release, featuring a different glossy picture sleeve and the inclusion of a third track, "Wild Heart". A 12" promotional single was also released to United States radio stations in 1983, featuring a full-colour sleeve, but playing the standard album version (in mono and stereo) on both sides. Nicks has often told the story of how she wrote the song. She wrote it on the day of her marriage to Kim Anderson on January 29, 1983. The newlyweds were driving up to San Ysidro Ranch in Santa Barbara when Prince's song "Little Red Corvette" came on the radio. Nicks started humming along to the melody, especially inspired by the lush synthesizers of the song, and "Stand Back" was born. They stopped and got a tape recorder and she recorded the demo in the honeymoon suite that night. Later, when Nicks went into the studio to record the song, she called Prince and told him the story of how she wrote the song to his melody. He came to the studio that night and played synthesizers on it, although his contribution is uncredited on the album. He and Nicks did agree however to split the publishing royalties on the song 50-50. Then, she says, "he just got up and left as if the whole thing happened in a dream." The main intro of the song features an Oberheim OB-Xa synthesizer. The synth-bass is played on a Roland Jupiter 8. On the Rock a Little tour, the Oberheim is replaced with a Yamaha DX7. There were two mixes made of the song; the generally more well-known album version (4:48) and the edited single version (4:18). Differences between the two are somewhat subtle, but the single version tends to have more of a "collapsed" or "mono" sound to it and the electronic drum programs are mixed, rather dry and flattened, especially in the song's intro bars; whereas the drum tracks on the album version are accentuated by a generous amount of reverb effect and harder compression. Acoustic drums were given a more backseat role on "Stand Back". There is a further 'polished' version of the track, with crisper percussion and louder foreground synth, featured on Nicks' 1991 compilation album Timespace: The Best of Stevie Nicks, remixed by Chris Lord-Alge and running at 4:59. “Stand Back” is performed in the key of B Minor with a tempo of 116 beats per minute in common time. The song follows a chord progression of A/G – G – D/A – A – D/A – G/B – Bm – A/B – B/D – G, and Nicks’ vocals span from A3 to B4. Two videos were filmed for the single. The first, which was never aired and is referred to as the "Scarlett Version", was a lavish production directed by Brian Grant and features Nicks in a Gone with the Wind type scenario. Upon seeing the completed video, Nicks rejected it as, according to Grant, she felt she looked fat. This version can now be found (with Nicks commentary) on the DVD supplement of her 2007 collection Crystal Visions – The Very Best of Stevie Nicks. As an alternative, a second video was made on a much lower budget than the original. Directed by choreographer Jeffrey Hornaday, it shows Nicks performing the song behind a microphone in a spotlight-filled room surrounded by glass walls and mirrors, interspersed with shots of choreographed dance sequences. This was the version aired on television and was also included on Nicks' 1986 video compilation I Can't Wait - The Video Collection as well as the aforementioned Crystal Visions compilation DVD. Nicks performed the song as the musical guest on the December 10, 1983 Saturday Night Live episode, with Liberty DeVitto of Billy Joel fame on drums and Marilyn Martin singing backup. The most recent live performance of the song in Nicks' solo shows is captured in the 2009 CD release The Soundstage Sessions, where Nicks chose the track as the opening number to her show, rather than placing it towards the climactic end of the setlist as per previous tours. Nicks began performing "Stand Back" with Fleetwood Mac on the band's 1987 tour. It is included on the Fleetwood Mac live concert video Tango in the Night (recorded in December 1987) and a (slightly extended) audio version from the same show is included in the 4-disc boxed set 25 Years – The Chain. Since then, the song has been performed on every Fleetwood Mac tour (with the exception of the On with the Show Tour) Nicks has been a part of, including the Behind the Mask tour in 1990, The Dance reunion tour in 1997, the Say You Will tour in 2003 (it is featured in the 2004 CD/DVD set Fleetwood Mac: Live in Boston), the 2009 Unleashed Tour, as well as the band's 2013 world tour. Linus Loves and Sam Obernik released a cover of "Stand Back" in 2003, which was a moderate club hit. Should Auld Aquentice Be Forgot, Sky Ferreira and Rod Stewart also performed live cover versions. Jillian O’ Dowd also recorded a cover on their covers album Liberties (2013). 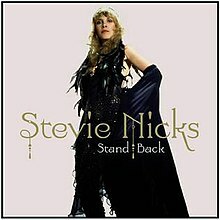 (2001) "Stand Back – Remixes"
The song was remixed and released again as a single on August 28, 2007 to promote Nicks' compilation album Crystal Visions – The Very Best of Stevie Nicks. This time the single went to number two on the US Dance Club Songs chart and number-one on the Hot Dance Single Sales chart. ^ a b c "Stand Back". Stevie Nicks In Her Own Words (inherownwords.com). Retrieved 2016-04-25. ^ Backer, Rya (April 2, 2009). "Stevie Nicks Wants To Work With Timbaland, Opens Up About Collaborating With Prince". MTV.com. Retrieved 2016-04-25. ^ Marks, Craig; Tannenbaum, Rob (2011). I Want My MTV: The Uncensored Story of the Music Video Revolution. New York, NY: Dutton. p. 110. ISBN 978-0-525-95230-5. ^ "Stevie Nicks 'Saturday Night Live' 1983". Waddy Wachtel. Retrieved 2018-08-07. ^ Kent, David (1993). Australian Chart Book 1970–1992 (Illustrated ed.). St Ives, N.S.W. : Australian Chart Book. p. 217. ISBN 0-646-11917-6. N.B. The Kent Report chart was licensed by ARIA between 1983 and 19 June 1988. ^ "CASH BOX Top 100 Singles – Week ending August 27, 1983". Archived from the original on 11 September 2012. Retrieved 2018-08-15. CS1 maint: BOT: original-url status unknown (link)Cash Box magazine. ^ "Year-End Charts: Top 100 Pop Singles,". Cash Box. December 31, 1983. Archived from the original on September 21, 2012. Retrieved 2018-08-15. "I Will Run to You"
"Has Anyone Ever Written Anything for You?" "Maybe Love Will Change Your Mind"
This page was last edited on 2 April 2019, at 14:13 (UTC).